FRANK SINATRA: AT THE SANDS: 1966: 5 STARS OUT OF 5 STARS: Sinatra and Count Basie and his orchestra- arranged by Quincy Jones. This was Sinatra’s first commercially released live album- recorded in early 1966 at the Copa Room at the Sands Hotel in Las Vegas. 22 songs including many classics associated with Sinatra- and the in between songs banter. His voice is still great and he makes it sound so easy and the band is fantastic. PETER GABRIEL: SO: 1986: 5 STARS OUT OF 5 STARS: Gabriel’s peak- his 5th solo album- some of his best known songs are on this album- Sledgehammer, Don’t Give Up, In Your Eyes, Big Time, Red Rain. One of the best albums of 1986- it lost out in the Grammy’s for Album of the Year to Paul Simon’s Graceland. After releasing 5 albums in his first decade as a solo artist- since SO 32 years ago- Gabriel has released but 4 studio albums total. I never cared much for his old band Genesis- with our without him but I am a big fan of the Gabriel’s 70’s and 80’s music. 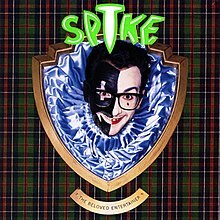 ELVIS COSTELLO: SPIKE: 1989: 4 STARS OUT OF 5 STARS: Coming after two brilliant comeback albums- in King Of America and Blood and Chocolate- this album seems a little less ambitious and the reviews then and now for Spike have been all over the place but while I agree it’s not an Elvis classic- I’ve always like it. 15 songs- my favorites are more towards the front of the album- This Town…, Let Him Dangle, Deep Dark Truthful Mirror, Veronica- which went to #19 on the Hot 100 in the US- EC’s biggest hit, God’s Comic and Tramp The Dirt Down. THE DOORS: STRANGE DAYS: 1967: 4 1/2 STARS OUT OF 5 STARS: Out of The Doors six albums- the first, last and this- the 2th are the best- the others are pretty mediocre. Morrison is the Andy Warhol of rock stars- overrated! Poet? He is to poetry what Jay Cutler was to quarterbacking in the NFL. Best songs on this-Strange Days, Love Me Two Times, Moonlight Drive, People Are Strange, When The Music’s Over… most laughable song- Horse Latitudes.